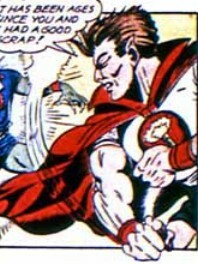 Powers/Abilities: Twenty foot tall giant, superhumanly strong, unaging and immortal unless slain by injury. Able to teleport. History: In primordial times the Prince of Good imprisoned a Demon who had been causing havoc across space, trapping him in a cave on Earth. When the Demon was freed in the early 1940s the Prince sensed his escape, and returned to stop his old enemy with the assistance of human boy Davey Drew.